President Carter on the grounds of the Carter Center in Atlanta. NEW YORK, JAN. 11 (JTA) — Fourteen Jewish members of the Carter Center’s board of councilors have resigned to protest the former president’s new book blaming Israel for the failure of Middle East peace efforts. 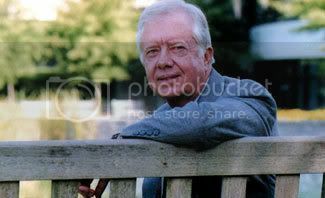 In a letter to President Carter obtained by JTA, the group wrote that the former president had abandoned his role as a peace broker in favor of malicious partisan advocacy, portraying the complex Israeli-Palestinian conflict as a “purely one-sided affair” which Israel bears full responsibility for resolving. The letter also cites a “disturbing” passage from Carter’s book, “Palestine: Peace Not Apartheid,” which appears to call for Palestinians to end acts of terrorism only if Israel abides by its obligations under international law and under the “road map,” a peace plan guided by the United States, European Union, United Nations and Russia. The passage appears to condone violence against Israelis, the signatories said. The departures had been in the works for weeks as the precise wording of the letter and the exact makeup of the resigning group was hashed out. Among those resigning were a number of prominent members of the Jewish community in Atlanta, where the center is located. Hours later, the Central Conference of American Rabbis, the umbrella organization of Reform rabbis, announced it was canceling a visit to the Carter Center planned to coincide with its March convention in Atlanta. Steve Berman, an Atlanta real-estate developer who was among the 14 that resigned from the Carter Center’s board of councilors, told JTA several weeks ago that the group wanted to bring along some non-Jews from the 200-member board. That effort apparently was unsuccessful. In an interview Thursday, Berman said that time considerations, as well as a desire not “to be disruptive to the work of the Carter Center,” had limited the group’s expansion. The Carter Center’s executive director, John Hardman, appeared to downplay the significance of the resignations. In a statement released Thursday, he thanked the board members for their service to the center while noting their limited role in the center’s operations and the relatively small size of the group resigning. Hardman did not respond to JTA requests for comment. Founded in 1982 by the former president and his wife, Rosalynn, the Carter Center promotes conflict resolution, freedom, democracy and global health. The center is situated in a 35-acre Atlanta park that is also home to the Carter Presidential Library and Museum and is two miles from Emory University, with which it has a longstanding partnership. Funding for the center’s $36 million operating budget comes from a mix of corporate and private philanthropic sources. In addition, a number of prominent Arab donors — including Saudi Prince Alwaleed Bin Talal Abdulaziz, Sultan Qaboos bin Said of Oman, and the governments of Oman, Saudi Arabia and the United Arab Emirates — are listed as having contributed more than $1 million. The mass resignation adds to the firestorm of criticism that has engulfed the center since the publication of Carter’s book. Critics have blasted the book as biased, inaccurate, misleading and missing key historical facts. Jewish leaders have lashed out at Carter for claiming in recent interviews that powerful American Jews stifle free debate on Israel, a claim they regard as anti-Semitic. Carter met last month with a group of rabbis in Phoenix in an attempt to patch things up, but the rabbis left disappointed. Many of the recent criticisms were echoed in the resignation letter, which also included refutations of several of Carter’s claims. The letter cited research by the Anti-Defamation League showing that Carter’s comments, in particular his use of the term “apartheid,” has energized white supremacist groups who long have claimed that Israel’s supporters have undue influence over the U.S. government. Days later, an Emory anthropology professor, Melvin Konner, withdrew from an earlier commitment to join a group advising Carter on how to handle the controversy swirling around the book. In a letter to Hardman, Konner cites the same passage as Berman’s group that seems to imply Carter’s acquiescence to Palestinian terrorism unless Israel makes further concessions. “It is imperative that the general Arab community and all significant Palestinian groups make it clear that they will end the suicide bombings and other acts of terrorism when international laws and the ultimate goals of the road map for peace are accepted by Israel,” Carter’s book states. “This sentence, simply put, makes President Carter an apologist for terrorists and places my children, along with all Jews everywhere, in greater danger,” Konner wrote. He also called on the Carter Center to distance itself from its namesake — a man he describes as “one of his heroes” — if it wanted to continue to thrive. But he conceded that the center was unlikely to do so. Konner said he had been asked to participate in the advisory group after expressing deep misgivings over Carter’s recent statements and seeking clarification from Hardman as to whether the Carter Center endorsed the former president’s views. It’s unclear what response he received. Hardman has since denied that any advisory group was in the works. Also Thursday, The Associated Press reported that Carter had agreed to defend his book at Brandeis University, though he will not debate Harvard law professor Alan Dershowitz, as originally proposed. Dershowitz said he would attend anyway and would be among the first to raise his hand to question Carter.